The photo on the left was taken at the Ranger Centre at Brodick Country Park on 9 August. Four healthy Swallow chicks almost ready to leave the nest and head to South Africa for the winter. This is the second brood reared here this summer. The photo on the right was taken at Kilpatrick Kennels on 11 August. It has four dead Swallow chicks. Like the ones by the Ranger Centre the Swallows built a nest early in the season but the Kilpatrick Kennels pair did not lay any eggs. Later in July they built another nest and this time eggs were laid. At the beginning of August both adult birds were seen taking food into the nest. Then the activity stopped. 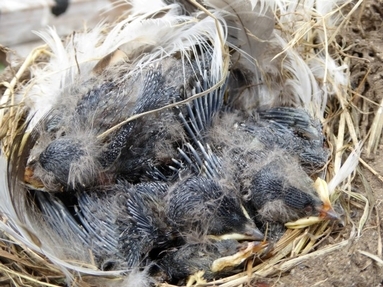 When the nest was checked on 11 August, the chicks were dead. Last year two broods were raised at Kilpatrick Kennels. This year there will be none. The difference? I suspect a shortage of food. 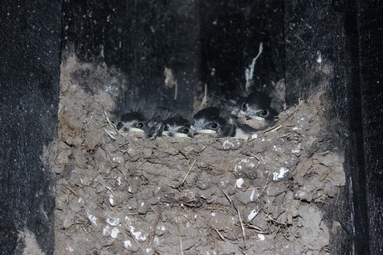 Swallows feed on flying insects and the prolonged cool wet summer may have reduced their numbers in some areas. How have the Swallows and House Martins fared in your part of Arran this summer? I look forward to hearing from you.